I have heard some rumblings in the blogosphere about an article from Smart Money. I know what you must be thinking - what on earth does an article in Smart Money have to do with Rachael Ray? Well, the article alleges that many cookbook authors have ghost writers instead of writing the books themselves. As a result, many of the recipes are not tested and they fail when attempted by home cooks. You can see a video based on the article here. Notably, the article does not say that Rachael has a ghostwriter. It says that many cook book authors use them and that Rachael has written an astounding number of cook books in the last few years. He never states outright that Rachael uses a ghostwriter, but he intentionally creates that impression in a not-so-subtle way. Other cooks, like Sara Moulton, admit they use ghostwriters. Nigella Lawson admits that her recipes were never tested after being converted from the metric system. Maybe someone in the media actually heard the same rumblings, because at her recent appearance at the Television Critics Association convention, someone asked Rachael if she writes her own cookbooks. Her response: "Yes, I do write them, every word!" 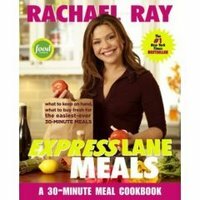 Rachael mentioned this awhile back and said her cookbooks were easy too write because the recipes come from her shows. Good enough for me. Cate - if you find a way to get that gig, please let me know!